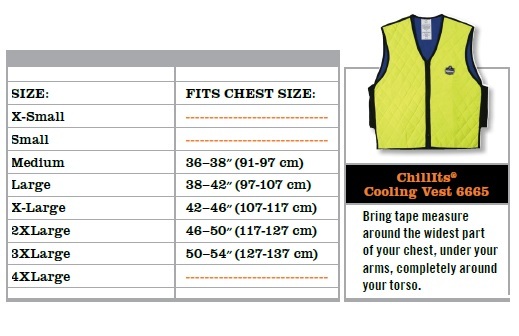 Chill-Its Cooling Vests are a great way to beat the heat and stay comfortable during the hot summer months. The amazing power of evaporation provides hours of cooling comfort for work or play. 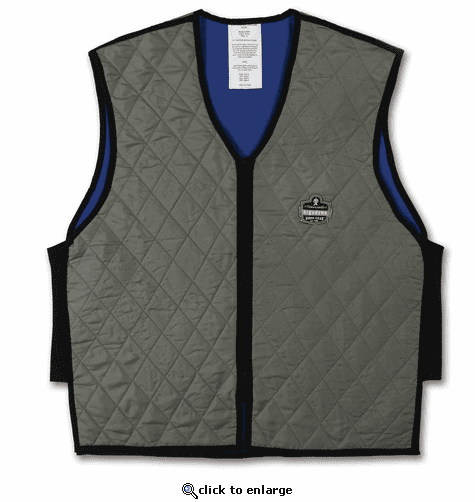 Simply activate your cooling vest in water and enjoy hours of effective cooling relief while at home or on the job. Chill-Its Cooling Vests keep you comfortable in the worst summer heat. The cooling vest is filled with non-toxic polymers that absorb 300 times their weight in water, then allow the water to evaporate, keeping you cool in any climate. This lightweight, durable, and washable Chill-Its vest features a unisex design with zipper closure in a variety of sizes from medium to triple extra large. Whether you are working in the scorching sun or planning on enjoying a sweltering concert or sporting event, the Chill-Its body cooling vest will provide you with hours of cool comfort. Just submerge in clean water for 1-2 minutes or until desired weight is achieved. Blot dry and cooling vest will remain hydrated for several hours. Re-activate by submerging in water as needed. Submerge in clean water for 1-2 minutes or until desired weight is achieved. Remove and blot dry. Will remain hydrated for several hours and may be re-activated by submerging in water as needed. I purchased this product in the extreme heat of summer. I was a bit skeptical. I had never seen anyone wearing this vest, but in desperation I placed my order. I was NOT disappointed. Keeps me cool in this ungodly heat. Fabulous.